It's true that a small act of kindness can go a long way. Gail Cook, a resident of Ferndale, Maryland, said one such act brightened her day when she came home on Wednesday. She discovered strong winds had brought down her family's flagpole. But when she reached her doorstep, she saw that someone had neatly folded their American flag and placed it in a box that sits on their front porch. When she pulled up the video from her Nest camera to see who she could thank, she saw her FedEx delivery driver Mike King. But the Cooks didn't have any packages delivered that day. King had gone out of his way to fold the flag. "I was like, 'Oh my gosh, I have to share this so people know what he's done,'" Cook said. She posted the video on Facebook and also reached out to King to thank him. "It's the Marine way," King said in the comments on her post. "I couldn't just drive by and do nothing." The post has garnered dozens of shares and positive comments from the Ferndale community. "How extremely thoughtful!" said one commenter. "Awesome act of patriotism," commented another. Cook said King has delivered packages to their home for several years. She said she and her husband got their Nest camera a few years ago as a way to keep tabs on the neighborhood and make sure their two children are safe. She said she never expected such a nice moment to come from having the camera. "We're just very grateful to him for stopping and, you know, taking the time out of his day because I'm sure this is a busy week for him," Cook said. 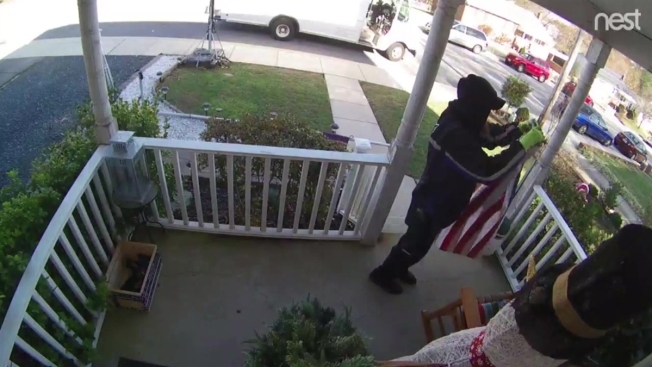 "You know, Cyber Monday - I'm sure he had a ton of packages to deliver and he took the time to fold the flag and fold our other flag ... he even came back to make sure he put them in a safer place so the wind didn't continue to blow them that day." Cook said she reached out to FedEx and hopes they recognize King for his good deed. News4 has reached out to King for comment, but has not yet heard back.